Last Saturday we went out for the second evening on the trot, having been to a concert by the St Petersburg Philharmonic at the Bridgewater Hall on Friday. Almost unheard of these days! This time we drove into Liverpool for a performance at the Liverpool Philharmonic Hall’s Music Room by the Canadian Arcadian folk band Vishtèn. We hadn’t heard of the band before I saw the advert for the concert, but having checked out their website I thought they looked like a good bet for an enjoyable evening – I wasn’t wrong! are the descendants of French colonists who settled in Acadia during the 17th and 18th centuries, some of whom are also descended from the Indigenous peoples of the region. They were expelled from Canada by the British, and some migrated to Louisiana forming the Cajun population in the USA. But some managed to hang on in Canada. Their music is a mix of French, Irish and Scots influences, including energetic reels and lively balads sung in the Acadian French dialect. There were some similarities with Cajun music which I like. Pastelle, the male member of the band played fiddle and guitar while the two female members, who are twin sisters, played various instruments, including keyboard, accordian, mandolin and tin whistles. They also provide percussion, with their feet! They efffectively tap danced while they were sitting down playing their instruments. I really enjoyed the evening and have been following up the concert during the past week listening to a CD I bought at the concert and via Spotify. I’d certainly go to see them again if I get the chance. 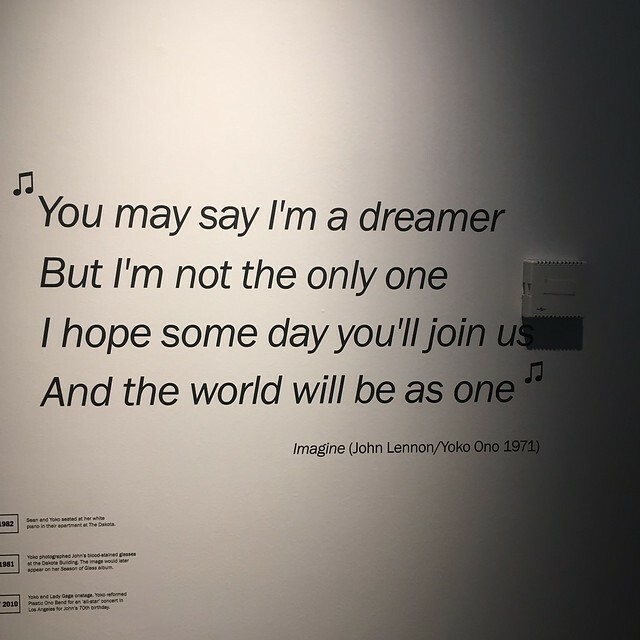 I was particularly interested to watch the documentary as only a few days before we’d visited an exhibition at the Museum of Liverpool – Double Fantasy – John & Yoko – which covered much of the same ground. 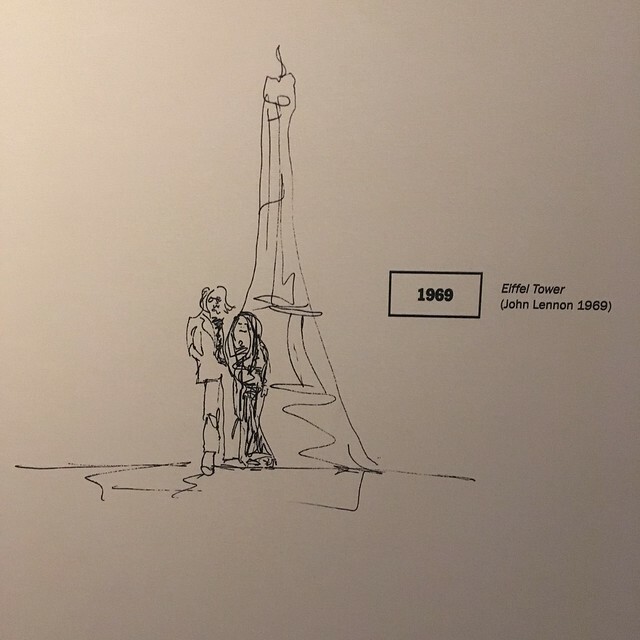 In many ways John and Yoko were an unlikely couple. 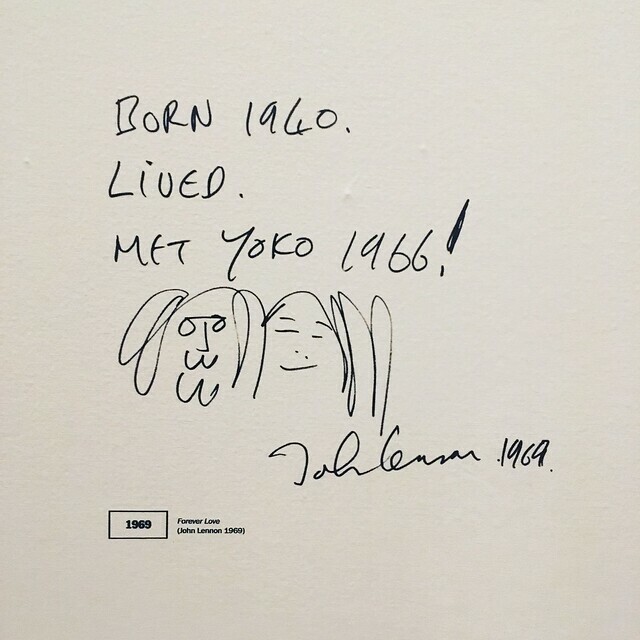 John a famous popular music star from a lower middle background from a working class city in the north of England, and Yoko a Japanese avant-garde artist from an upper class background. 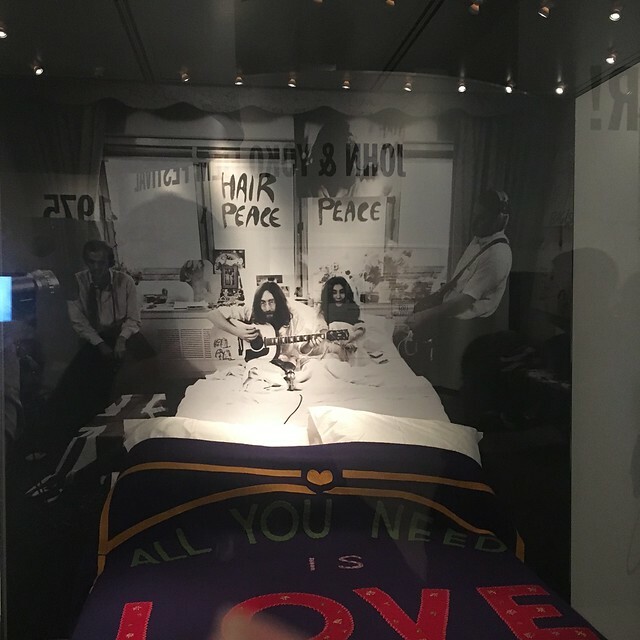 But they clicked with John, perhaps, seeing in Yoko what he really wanted to be (a cosmopolitan avant-garde artist, not an upper class Japanese woman!). 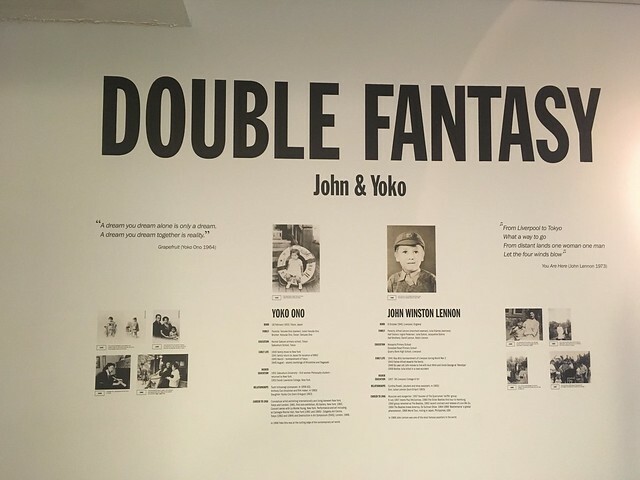 The exhibition shows how they influenced each other’s work, with Yoko perhaps having a bigger influence on John than John on Yoko. For many Beatles fans, Yoko was not popular, to say the least. Many of them blamed her for the breakup of the band. 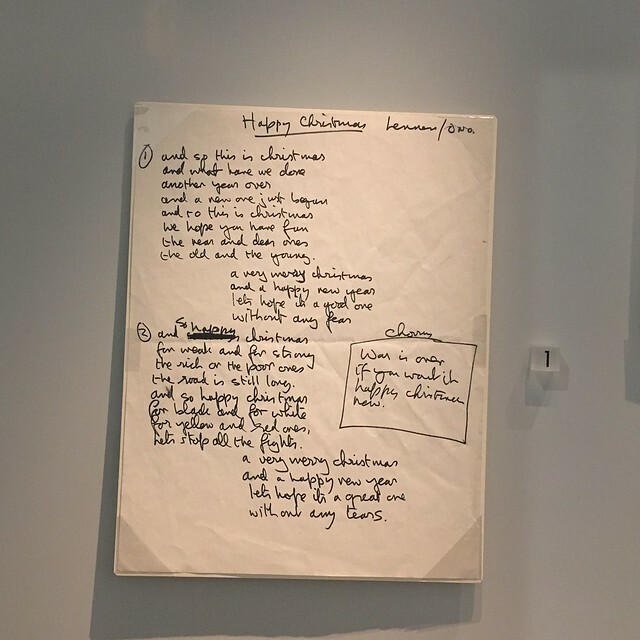 John took her with him to recording sessions and she, allegedly, offered her own musical suggestions and tried to join in on some of the songs. This certainly didn’t go down that well with other members of the band and probably widened rifts that were already starting to open. My own view is that Yoko’s input probably accelerated what would have happened in any case rather than being the primary cause. 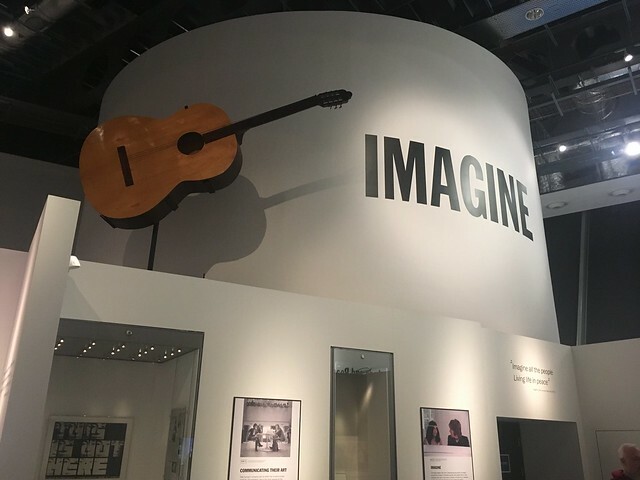 It’s rare for a creative partnership to last forever and the Beatles were already starting to drift apart as they developed their own interests. Yoko was, for many, an easy scapegoat, and some of the antagonism was no doubt because she was Japanese. There was an underlying racism and the memories of WW2, which only ended just over 20 years before, meant that many people had a dislike of the Japanese. Attitudes have mellowed over the years, but probably hasn’t completely gone away. 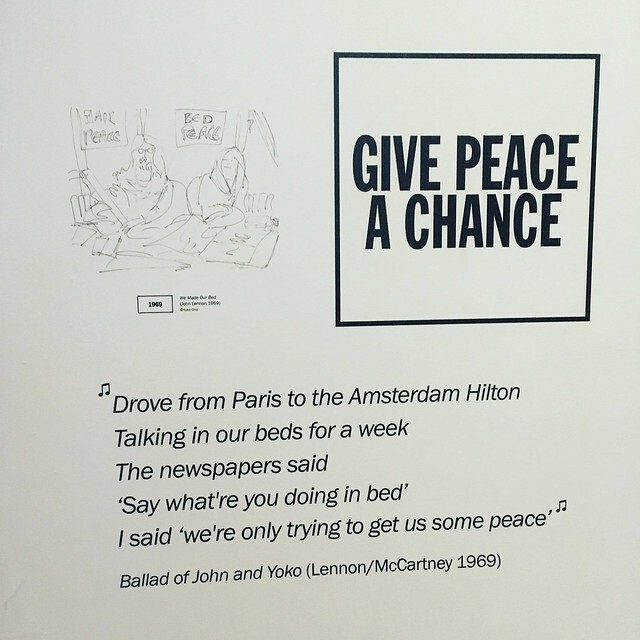 The exhibition was chronological, taking in all the key events of their relationship from their first meeting at Yoko’s exhibition illustrating them with artefacts, works of art and song lyrics, a rolling programme of films and music videos and a music room, overlooking the Mersey, with tracks from albums playing and featuring album cover art. The week after our trip to Amsterdam the “Beast from the East” arrived bringing freezing cold weather and heavy snow. Much of Britain was paralysed as we aren’t geared up to deal with it. A concert by El Brooke’s at Liverpool Philharmonic Hall was cancelled as she was stuck somewhere down south in the snow. But the same evening we drove over to Liverpool for a different concert at the Phil, in their smaller venue, the Music Room. We had tickets for a concert by Two instrumental folk bands, Spiro and Leveret, the first date of their national tour. The north west was lucky in that although it was bitterly cold, we only had a smattering of snow. So our journey over to Liverpool was uneventful. Less so probably from the bands who’d driven up from the south (Spiro are based in Bristol) and the next date of their tour, in Settle in the Yorkshire Dales, had been cancelled due to the snow over there. I discovered Spiro when a track of theirs was played on the Cerys Matthews show on BBC6 Music and since then I’ve been a fan. So I was keen to see them live. In Liverpool they were on first, with their minimalist take on traditional tunes. 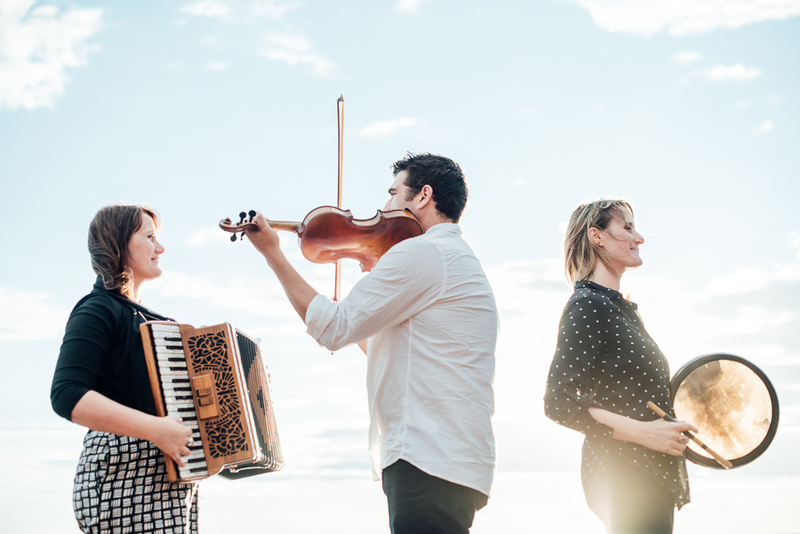 The four piece – fiddle, mandolin, accordion and guitar, take a traditional tune as a starting point then weave complex riffs and melodies around it. Although the accordion player largely stays seated occasionally standing up, the other three prowl around the stage, at times duelling musically with each other. Leveret are also accomplished musicians who play traditional tunes. A three piece – a fiddle a squeezebox and an accordion – staying seated throughout their set, they’re much less animated, except for the fiddler whose legs move almost like he has ants in his pants! Their approach to the tunes is different than Spiro, more traditional. Both sets were excellent and I especially enjoyed seeing Spiro playing live. As an encore both groups returned to the stage to play together. A thoroughly enjoyable evening’s entertainment. We stepped back out into the cold. Some snow had fallen while we were inside the venue but hadn’t stuck on the road. Driving home down the M62 and M6 it started to snow. But we got off lightly. It had gone by the morning when I had to drive to Chester. Well, that’s work done now until the New Year and I’m just beginning to feel Christmassy. Saturday evening, the start of what was a busy long weekend, saw us driving over to Liverpool for a concert at the Art Deco Philharmonic Hall. We had tickets to see a concert – a double header with Hannah Peel’s Mary Casio: Journey to Cassiopeia and Tubular Brass’ arrange ent of the classic “Prog Rock” album from the 70’s, Tubular Bells, arranged for a brass band. These days, I’m a regular listener to BBC 6 Music and I’d heard selections from the Tubular Brass album and the single released by Hannah Peel in advance of the album. I enjoyed both enough to buy tickets to go and see them performed live. Now Prog Rock has had something of a bad press these days, the cliche being that it was about pompous, overblown tracks by self indulgent musicians. There’s an element of truth in that but I that isn’t the whole story. As a teenager, like many other six formers, I was a fan of bands like Yes, Pink Floyd, Genesis and the likes and before they started to take themselves too seriously, I think they produced some good music – even if it did mainly appeal to male sixth formers and students! The audience was mainly well over 50 with a scattering of younger faces. Probably made up of an interesting mix of brass band aficionados, prog rock fans of a certain age and others attracted by the plays on Radio 6. Hannah Peel was on first and played the whole of her album that had been released only the previous day, although she had performed it at some festivals over the summer. It’s a 7-movement odyssey composed for analogue synths and a full 29-piece colliery brass band and tells the story of an unknown, elderly, pioneering, electronic musical stargazer and her lifelong dream to leave her terraced home in the mining town of Barnsley, South Yorkshire, to see the constellation of Cassiopeia. It’s seems a crazy idea mixing synthesisers and brass but it worked. 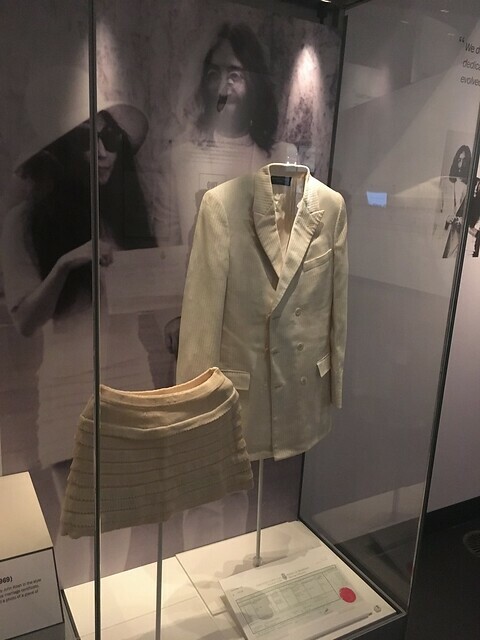 Hannah was on stage dressed in a silver trouser suit behind a bank of instruments, bringing back memories of the likes of Rick Wakeman and Keith Emerson, accompanied by the musicians of the Tubular Brass ensemble and with swirling visuals projected on an overhead screen. Swooping stellar synths combining and merging with the more down to earth brass and finishing with a recording of Hannah’s grandfather from Manchester Cathedral when he was a young choir boy at the end of the final movement The Planet of Passed Souls. After the break it was time for Tubular Bells scored and arranged by Sandy Smith who first encountered the Mike Oldfield album as a teenager when it was released in the mid 70’s. The original vinyl album was central to our frequent Saturday night house parties, especially as the night drew late and a combination of fatigue and the effects of early experiments with alcohol took hold. It is almost impossible to convey to those not around at the time the seismic impact which the release of Tubular Bells had on young, enquiring musical minds. The original album consisted of two pieces of music, each taking up a whole side, made up of several sections of multitracked instruments played by Mike Oldfield himself. In the Tubular Brass version the music was played by different combinations of brass instruments. Hannah Peel joined in, introducing the instruments at the end of the first half, originally done by Viv Stanshall on the original album and contributing some synths during the second half. I thought the brass arrangement really worked and, if anything, worked better than the original. To end the performance the ensemble played 3 prog rock pieces, finishing with a brass arrangement of ELP’s version of Fanfare for the Common Man. Two great performances. Brass and synthesisers – what’s not to like? Just after I’d arrived at the National Gallery of Ireland on Sunday and was starting to explore (I had a couple of hours before my time slot for the main exhibition), when I wandered into the Shaw room, a rather grand large room close to the Merion Square entrance, it was clear something was going on. I could see a group of people with musical instruments who were clearly setting up to perform and several people setting up easels. It didn’t take me long to suss out what was going on. Like most Galleries holding major exhibitions, the National Gallery of Ireland has held a number of events to accompany the Vermeer and Masters of Genre Painting Exhibition, and this was one of them. Many of the paintings in the exhibition feature musicians and musical instruments from the Dutch “Golden Age”– virginals, lutes, harpsichords, violas and the like as well as singers. 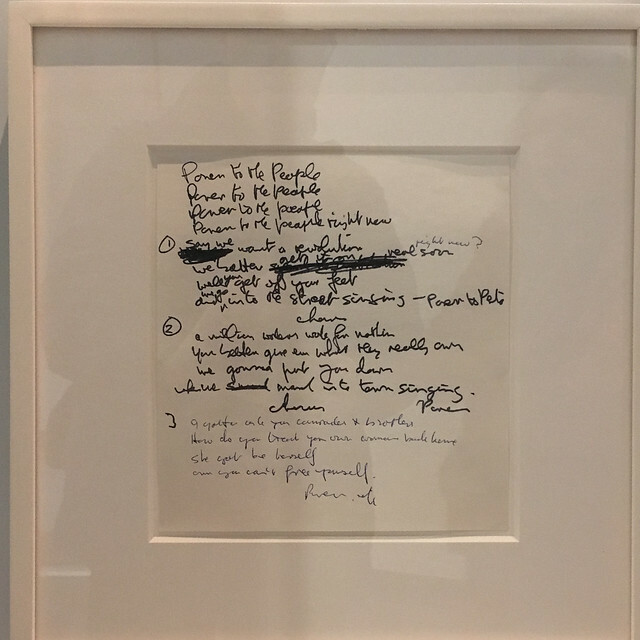 So the Gallery had organised a collaborative event – Performance Art – with the Royal Irish Academy of Music (RIAM) and the Royal Hibernian Academy (RHA). Musicians from the RIAM performed music from the Dutch Golden Age on instruments of the time, while members of the RHA had set up their easels so they record the scene live – sketching and drawing. A good crowd gathered to watch the musicians and the artists at work. It was an enjoyable event and I stayed for a good hour, only leaving because it was getting close to my time slot to see the exhibition. The artists were Una Sealy, Blaise Smith, Cian Mcloughlin, Sean Molloy and Comnghall Casey. They didn’t seem to be at all put off by everyone watching them at work and taking photographs.